Use on lighter areas if overlaying on images or graphics. 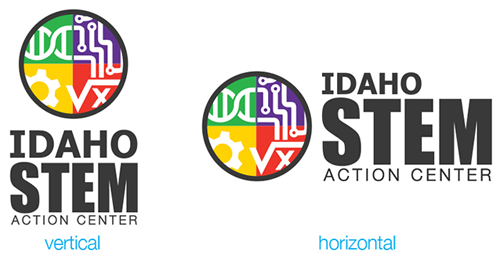 When using an Idaho STEM Action Center logo consider its usage then its placement. When using a logo for a publishing program or document layout, use a JPEG file when placing on a white or blank background such as a letterhead or a postcard. IF YOU USE A JPEG FILE OVER AN IMAGE OR COLOR you will see a white box around it. Got to next step. Use a PNG file, which has a transparent background, when placing over an image or over a busy background. Next Placement. Place logo with 1/2" from edges or on approved content. STEM Action Center provides the use of the logo for social media that promote, announce or advertise media and stories that pertain to the advancement of science, technology, engineering and math. Use PNG/JPG files for social media. 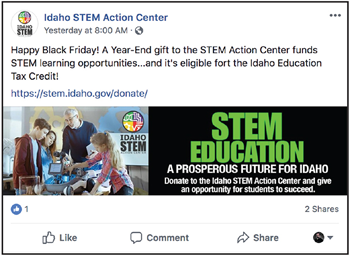 Please be sure to tag us in all posts and pictures from your STEM sponsored events by mentioning our name, Idaho STEM Action Center, and tagging us on Facebook @idahoSTEMAC. "Thank you to the @idahoSTEMAC for sponsoring this years (event name). Join us on (date) at (venue) for (event info)." *Include a registration link or even web page if you have one. "Thanks to our generous sponsor(s) @idahoSTEMAC for creating another successful (event name). We couldn't do it without you!" *Include pictures if you have them. 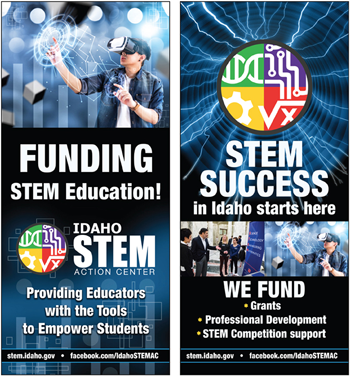 STEM Action Center provides the use of the logo for items such as posters and banners. Vectors are also used for screen printing such as t-shirts, hats and bags. Approval is required. Use EPS Vector files for anything needing large format printing and screen print promotional items. The EPS files can be downloaded here in a zip file format. 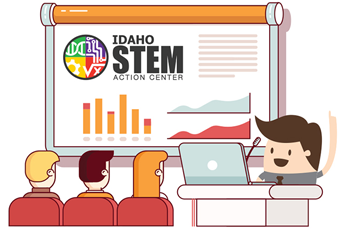 STEM Action Center provides the use of the logo Powerpoint types of digital presentations and videos. Use PNG files for anything digital. The PNG files can be downloaded here in a zip file format. Download ALL JPG files in a zip file format. Download ALL PNG files in a zip file format. Download ALL EPS files in a zip file format. To download all formats for each logo style, click on the logos below to download a zip file. Reverse logos will download without black box in PNG and EPS format only.